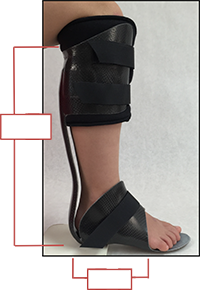 The prefabricated orthosis are made in two strengths, Firm and Moderate. A firm core spring will produce 25-40 pounds of resistance force between 10-15 degrees of flexion. A moderate core structure produces 15-25 pounds of resistance. This range of measure is based on the normal range of motion in gait. At a neutral standing position the core structure is slightly flexed, producing a small force for standing stability. During gait, the ankle progresses into 10 degrees of dorsi-flexion before the moment of heel off. At that point plantar flexion occurs for propulsion. The core structure is designed to produce a quickly increasing resistance. This resistance will load up over these 10 degrees of motion to give the desired propulsion force to replace the deficit calf function.